We need more fun summer songs that aren't by idiot Top 40 artists. I think James Curd is one such genius. Signed to DFA, he, with the help of one hell of a wonderful vocalist, pumps out some of the most exhilarating hip-hop disco (or whatever the hell you want to call it) you can imagine. The sultry yet energetic funk bass drives along with the syrupy lyric flow making for an incredible modern tip of the hat to a style of music we've not seen for decades. 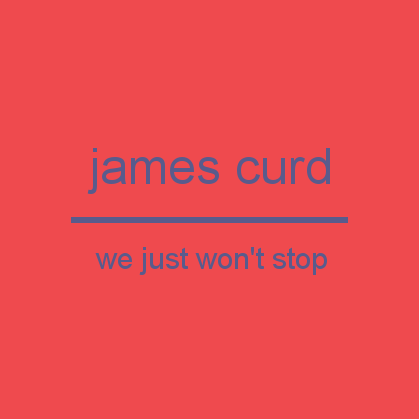 "We Just Won't Stop" is one of Curd's less deep housey jams, and that's a good thing. "Boom," for example, is a decent tune, but it's too light on the vocals for me; "Buffalo Girl" is way funkier for sure, but it's still a little too finicky, jumpy. That was a short one! Grab the 12" at DFA's Web store or at the Amazon.com MP3 shop. Oh, and yes, this song is on the last BBBD mix. This link won't import into itunes after it is downloaded. Can you re-upload it? Tell me if the new link works. I have no idea what's wrong with the MP3, so if my second upload doesn't import, you might be having technical difficulties on your end.